Some love Italy for its food and way of life, some need to travel to Europe for work and cannot stay more than 90 days without a visa, while for others they have memories of their grandma singing Italian songs before falling asleep and would like to get Italian citizenship to return to their roots. 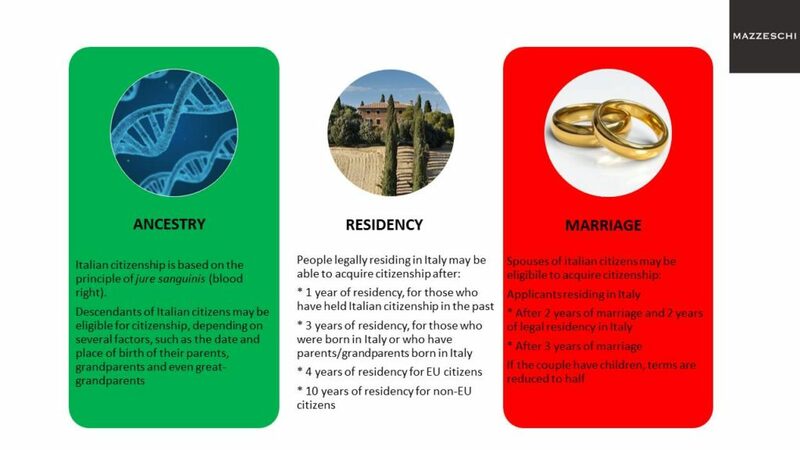 For these reasons and for many others, there is a possibility to obtain Italian citizenship in several different ways. The most common ways are by ancestry/descent, marriage/civil union, and residency/naturalization. Are you a descendant from one of the millions of Italians who left their homeland during 18th and 19th century to settle abroad and improve their conditions? In that case you may meet requirements set forth by law to submit the application for Italian citizenship by ancestry. In fact, Italian citizenship law is currently based on the principle of jure sanguinis (blood right, according to ancient Latin). This means that a child born to an Italian mother or father have also the right to claim Italian citizenship, regardless of where the child was born. Requirements are based on a combination of various factors and events related to parents, grandparents and even great-grandparents. The primary requirement to be eligible to apply for Italian citizenship is to have at least one ancestor born in Italy who possessed Italian citizenship, without any generational limit. If you are married or in a civil union with an Italian citizen you may already meet compulsory requirements to apply for Italian citizenship, or you will probably meet them in the near future. The requirements depend on the place of residency and on the presence of children. For couples residing in Italy requirements are 2 years of residency and 2 years of marriage, while for couples residing abroad, the condition is 3 years of marriage. When children are present, both terms are reduced to half. Did you simply fall in love with Italy and decide to live and settle down here? This could be an interesting option for you! If you have been legally resident in Italy, and you are still resident, you may be eligible for citizenship through residency and apply for Italian citizenship through naturalization. Also in this case the requirements can vary greatly depending on several factors, such as your nationality, the length of your stay in Italy and even the status of your parents and grandparents. It is important to highlight that Italian law allows double citizenship, so if your current citizenship accepts the same, you don’t have to choose between Italian citizenship or another citizenship, you can have both! The Italian passport is one of the most powerful in the world, so if you need to travel for your job, or would just love to obtain one, you can. Do you think you may meet the requirements for any of these paths? 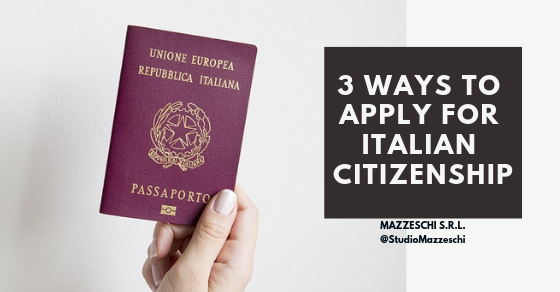 In order to determine whether or not you would qualify to request Italian citizenship, please feel free to contact us by filling out the online form, or send us an email to citizenship@mazzeschi.it. The initial assessment is free of charge!